There are four main types of tomatoes: cherry, with small, round fruits perfect for salads; plum, which are more oblong and good for sauces; and medium and beefsteak, which are large, meaty and good for slicing. In addition, there are heirloom varieties, which include varieties from all of these categories and are known for their rich tastes, unusual shapes, and bright, unique colors. 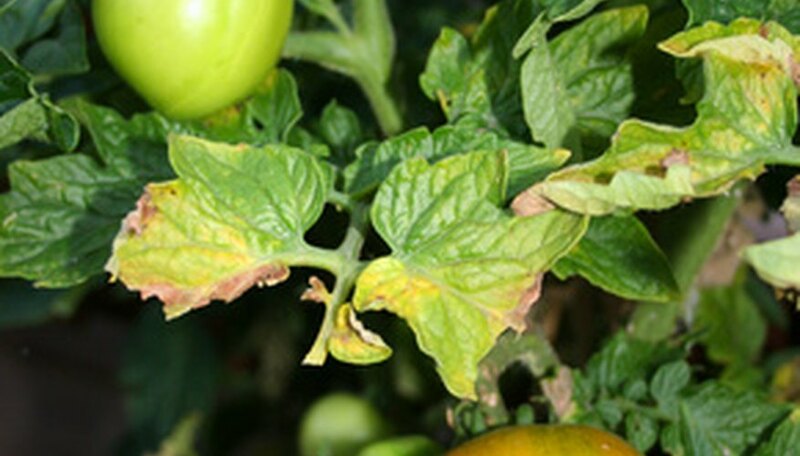 Identifying the type of tomato plant helps assure that it is suited to the intended use. The fruits of cherry tomatoes are smaller than other tomato plants, but they are found in larger clusters and may still need to be caged or staked. Sweet 100s have large clusters and vigorous vine growth, with very sweet 1-inch fruits; gardener’s delight have bright red, bite-size fruits that are also very sweet; and small fry is a disease-resistant variety that has a strong flavor and is suited to growing in 5-gallon containers. Plum tomatoes have thick, meaty walls but low juice content and are used primarily in cooking and canning, although many taste good fresh, as well. They are categorized into two growth habits: determinate, which bear their crop all at once, and indeterminate, which continue to grow and produce flowers and fruits all season. Determinate varieties include the compact plants with extra large, dark red, crack-resistant fruits of bellstar; the vigorous, disease-resistant plants of Italian gold, with an abundance of golden-orange fruits; and the extra-early bearing, disease-resistant Milano, with meaty, full-flavored, dark red fruits. Indeterminate varieties include: the heavy-yielding, vigorous plants of giant paste, with large, red fruits; the squarish, bright red, thick-fleshed fruits of San Marzano, which have a mild flavor and little juice; and the heavy-yielding plants of yellow bell, which produce bright yellow fruits with rich flavor. The smooth, meaty firm fruits of early girl improved are disease-resistant; better boy has full, semi-firm fruits that have good taste and are great for slicing; golden boy has yellow, firm, low-acid fruits with mild flavor; and the compact, bushy growth of patio tomatoes makes them ideal for container plantings. Beefsteak tomatoes have very large fruits, often weighing up to 2 lbs., making them wonderful for slicing. Burpee’s supersteak has meaty, firm, oblate fruits; beefmaster is resistant to fusarium and verticulum wilt, and has large, thick-walled, juicy fruits; and bush beefsteak has firm, deep red fruits and will grow under adverse conditions. Heirloom tomatoes are as easy to grow as traditional varieties, with a wide selection to choose from. Brandywines have purple-red, large fruits on very vigorous plants; Cherokee purples are heavy-yielding plants, with purple-red fruits and rich, sweet flavor; the pink, bell-shaped fruits of New Zealand paste with their meaty and rich flavor are heat- and drought-tolerant; bg rainbow has very large, orange fruits, striped with yellow and red and a marbled flesh that has sweet flavor; flame is crack-resistant and bears large fruits with gold and rose flesh; and the large, golden yellow fruits with rich flavor of goldie, and the creamy, white, sweet-tasting fruits of great whites are both produced on large, vigorous vines.